baptism | what do we say about these things? baptism – what do we say about these things? Having returned from the Boundary Waters, I can quickly admit we are not always at our most presentable. After a week of not showering, scraggly facial hair and using my only comb once, bug bites all over and mud smears on my clothes, that’s not how I generally (for example) try to show up on Sunday mornings. Anyway, I toyed with the notion of bringing “Lord of the Flies” along to read to my Boundary Waters group, but I decided that a story about a group of young people off in the wilderness who turned to the worst possible outcomes of being murderous maybe wasn’t the most sensible reading choice. Yet now, returned from the wilderness, I’m nevertheless confronted by the same situation in this difficult Gospel reading, as it’s not only about the least presentable Bible reading we’d like to have, but it seems to embody some of our worst tendencies or outcomes. Maybe that it makes us uncomfortable is a good sign, at least. So for those who don’t know the story, “The Lord of the Flies” is a book about a group of boys stranded on an island. They begin organizing themselves with systems to establish order—for who takes care of shelter and fire and food and cooperating on decisions. But they then veer toward laziness and fear and brutal aggression. We might tend to label the boys’ decline as returning to primal instincts from civilized behavior. We’re apt to describe society as good and the wild as bad. We also get diverted to believe our flesh and bodies and daily existence in this world are sinful and that we’re trying to escape to a more religious and spiritual and heavenly existence. But we can’t quite agree with those labels. The boys in the book had been scared of a beast, but it isn’t separate from them or part of nature. The island isn’t to blame; we get the much more terrifying insight that the Lord of the Flies is inescapably among and within them, dehumanizing themselves. Against that, let’s consider what it means to be truly human, to be seen as good creatures of God, made in the image of God, to live with the life God intends for us. That is really what’s at stake here in the diabolical confrontation of what controls our lives. To understand that, we can start to dive into this hard Gospel reading with one of the most important biblical distinctions for what it means to be human. Brace yourselves, because this may be uncomfortable. If you have a sense that someplace inside of you is a soul, that there’s a divine little spark, waiting to rejoin God even though the rest of you will decompose (and has already begun to decompose and rot and wear out as you age), if you think that flesh is corrupt, but there’s an ideal truer inner self, then you are not on track for how the Bible sees your humanity. In the Bible, there is no separate soul. Your soul does not go to heaven. You don’t have an invisible spirit that flies away when you die. That isn’t how the Bible talks about this. That is Greek philosophy. That is Plato and is a perversion of the Bible’s sense of God’s good creation. That’s why it’s so important to understand, because that dualism incorrectly labels life here as bad, as ungodly. That directly contradicts God who says this is good, who says this is so good and loved this world so much that God wanted to be part of it, to come and share our existence, to be incarnate in Jesus. This is also why we talk about the resurrection of the body, because you’re all you. There isn’t a piece that can be separated out. If something of you will exist after death, it needs to be—and God wants it to be—the whole you. Well, that shows an infected translation. The original word there is “psyche.” It’s a word we know as part of “psychology” (which we obviously don’t define as the study of souls). It may be helpful to know that psyche is also in the last verse translated as “life,” (“those who find their life will lose it, and those who lose their life for my sake will find it”). Life is a better sense of what psyche means in the Bible. It’s about truly living, about the life God intends, about being who and how we’re meant to be. One example* I read this week illustrated it by saying that the loss of life during World War 2 isn’t only measured by the body count of soldiers, but also by Germans following Hitler and being corrupted by Nazi ideals in a way that truly defaced humanity, chasing after power and seeking to exterminate their siblings instead of loving and helping them in their time of need. (We do use the term “soul” in this sense, too, for when a nation is so misguided it has collectively “lost its soul.”) And in that sort of instance, we could pretty readily say that that’s not the sort of life that God intends. In a very honest way, life was being destroyed, thrown out to trash heap of burning refuse. World War 2 was also a stark instance of the division that these tensions create. For Jesus’ notion of bringing a sword to strike against those who would abandon the goodness of life, some might take even so much as the atomic bombs on Hiroshima and Nagasaki in that light. That may be too stark, though, as I’d wonder about the cure being as bad as the disease. Still, it leads us to the sense of divisiveness Jesus describes. If we are standing on the side of life, it must mean we are opposed to what would steal it away or destroy it. In the early Christian community, some of that difficult sense was likely even present in families, so the divisions Jesus names weren’t prescriptive but descriptive for those who were having to face the hard realities of life not going as it should. This soul-threatening destruction is also the sense in the book “Lord of the Flies.” Those young people on the jungle island turned from supporting each other and caring for each other instead toward Beelzebub and that corrupting influence. Even while they still lived, they lost what the point of life was. They didn’t need to bow down to idols to lose track of the goodness God intends in their lives. The way of death came to hold dominion or dominance in their existence instead of the way of life. That brings us directly to the reading from Romans. Alongside the divisive Gospel reading, this may feel quite pleasant. But I also want us to pause with it to continue hearing some shock. As it talks about baptism, and as we are preparing to turn toward the font for Rakesh Allen in just a minute, I’ve been feeling this passage this week not only with our standard Lutheran ears but also with Rakesh’s mother’s ears, with non-Christian Hindu ears. As we said to begin, this may not present ourselves with our best foot forward, because it could be terrifying that the reading proclaims what we’re doing in these waters is putting her son to death, co-crucifying him with Jesus, killing his old self. For this nine-month old, we probably maintain a notion of innocence and original blessedness, of the goodness of God’s creation. For Rakesh, we’d likely be ready to argue against Plato who wanted to claim that this life is corrupt. But if we don’t see babies as bad, why is Rakesh being put to death? Why do we claim he needs a new life? In a strange sense, our Christian theology proclaims that those powers of evil are defeated at the very moment they seemed to be victorious. Jesus can risk sharing with you that “those who find their life will lose it, and those who lose life will find it” because in the ultimate sense that’s exactly what happened to him. The death-dealing powers of oppressive might and greedy influence put Jesus to death. In that would be the clearest example that their dominion won, their lordship prevailed. But in the resurrection, we proclaim that their way of death was only a lordship of stink, the mastery of dung. Death had been undone by the Lord of life. And what we proclaim in baptism for Rakesh and for you is that those deadly powers are now impotent. They have no control over you. The Lord of the Flies has lost, has been exterminated. Since you have died with Jesus to evil and sin and live now only to God’s ways. The only thing that can rule for you now is life. That is what finally has control. So even while the old ways continue to try to corrupt or cause consternation, you can retort that you have been baptized and can find encouragement and stand steadfast that God’s goodness will not be undone, that resurrection gives you confidence in the Lord of life. With that assurance, you are free to join in sharing the risk of the struggle for life, not just for yourself in the survival of the fittest, but on behalf of all of God’s good creation. So let’s get ready for it, as it’s renewed in ourselves and as we witness Rakesh Allen is enlisted not only for the struggle, but celebrating that he is alive, now and forever. The first thing for today is an explanation and apology. Epiphany is January 6, and this festival of the Baptism of Our Lord is usually the first Sunday after Epiphany, which was last Sunday, but we were celebrating our choral service. So when you have to explain to friends and classmates and coworkers tomorrow that your church is a little slow, I apologize for that. We’ll see if we can fix it by the end. We may wonder what about the baptism of Jesus we need, or why this is worth paying attention to. We may ask, does it tell us something important about Jesus, or is it because it tells us something important about us? To start reflecting on this occasion, it sure seems that the baptism of Jesus is not like ours. I mean, we had nine baptisms here this past year, most of them when we were gathered together for Sunday worship services. You were here and part of those experiences. So how would you describe them? Nice? Community-building? Good to see young families and cute babies? Nobody said that at a single one of those baptisms the roof was torn off the building, a bright light shone in on the child or a dove came to rest on them. And the voices we heard didn’t come echoing with the thunder but were plain old regular human voices. So we might draw distinctions that the baptism of Jesus was extraordinary, was special, very different from our baptism. With that, another line is often drawn that our baptism washes away sins, but Jesus didn’t have any sins to wash away. Matthew doesn’t seem concerned about making that theological point in this story. I mention it partly because we have a bad conception of sin, mostly viewing it as the nasty little secrets and bad habits and quirky peccadilloes and guilty pleasures, but that is really a weak definition of sin. Against all that fierceness, you could feel the tone shift as if our reading today began with a big but: but “then Jesus came.” John seems to have expected a tough guy, busting in, taking charge, tossing out the bums. But Jesus comes, not with the ax or burning chaff or in all his glory, but comes and asks to be baptized. That’s the first important thing we learn here about Jesus. Asking what it tells us, while you could take it that Jesus needed to repent or was just a wimp, it’s better and more likely that his means and ends weren’t John’s. So he could be modeling what it’s like to turn from our own ways and toward God’s way. Or showing us that God’s grace is never earned but always received as a gift. Maybe he goes through with it so we can hear about the Spirit resting on him and the voice calling him the Beloved Son. Maybe it’s about the importance of baptism. That raises the next question, of whether the baptism of Jesus is like our baptisms or is completely different. By the simple fact that there aren’t these miraculous phenomena at our baptisms, does that mean we’re left with something second rate? I’d argue wholeheartedly against that. I firmly believe some of the point in this story about Jesus is so we can understand the same thing in our baptisms. Even though you couldn’t see the Spirit descending on you, and even though it sounded like my voice, or like some pastor’s voice, or whoever did it, still by means of your baptism, with that splash of water, God was declaring: I choose you. You are my son. You are my daughter. I love you. I’m pleased with you. That message of claiming you always and delighting in you no matter what is exactly the purpose and reason for baptism. Your baptism expressly connects you to Jesus. Within our baptismal liturgy, that’s proclaimed in words of prayer saying, “At the river your Son was baptized by John and anointed with the Holy Spirit. By the baptism of Jesus’ death and resurrection you set us free from the power of sin and death and raise us up to live in you.” That’s why the paschal candle is rekindled today, as a reminder that your baptismal candles share that flame, a symbol of Jesus’ death and resurrected presence. As we remember our baptisms in a minute, we renew the covenant connection with newness of life in Jesus. That points to another aspect of reflection for this day. There have been times when we associated baptism with going to heaven, through the promise of eternal life. That was vital yesterday at the memorial service for John Goltermann, for example. It can be the central promise for baptism in newborn intensive care units. But mostly, when we gather in church and when we need to think about our baptisms, it isn’t because we’re worried about going to heaven. It isn’t only about death and resurrection like rising from the grave, but is dying to an old way of living and newness of life we’re living into already. We have some of that perspective from Martin Luther. Today you have in bulletins the first bit of his Small Catechism, and it will be most of the way through this 500th anniversary year of the Reformation before we get to the section on baptism, but for a preview, Luther reminds us that baptism means a daily dying and rising. It’s not only amid tragedy or after we’ve drawn our last breath, but is about how we’re rising to live each and every day. It’s not just an eventuality, but is actually changing you here and now. This is similar to a discussion with Confirmation students and their families and mentors this week, that it’s foolish to think of Confirmation as happening once and for all, that in the spring of 8th grade you’re able to say, Yep, I agree with this faith and am interested in participating in it. Rather, every single day we could be Confirmed, could gather here at church and say to each other, here’s what I believe today and where I’m left wondering, here’s what I find important, here’s how I expect God is working in me and in this world. That every-day-Confirmation would be essentially the remembrance of baptism, the daily dying and rising, the repentance of trying to orient our lives on what God is calling us toward and working in us. The ongoing reality of living as beloved by God and embodying that for daily existence was also the case for Jesus; if it would’ve only been about his death, about his ending on the cross and the promise of new life from the tomb, then Jesus could’ve been baptized near the very end of the Gospel. Instead he does it right away, so we know this promise and the presence of the Holy Spirit with him in all of his life, in all that he does, with the power to go “about doing good and [struggling against] the devil,” as we heard Acts describe his ministry. Again paralleling our lives, most of us were baptized as infants, not as an insurance against something bad, but as assurance that God’s blessing is with us in all that happens to us, throughout our lives and beyond, giving us power to keep doing what’s right. A genuine revolution of values means in the final analysis that our loyalties must become ecumenical rather than sectional. Every nation must now develop an overriding loyalty to [hu]mankind as a whole … This call for a worldwide fellowship that lifts neighborly concern beyond one’s tribe, race, class, and nation is in reality a call for an all-embracing and unconditional love for all [hu]mankind. I’d like to begin introducing you to Alexa Rose, her parents Danielle and Ramon and their family, to get ready for her baptism and to orient us amid this Christ the King Sunday. The odd connection is Alexa’s grandmother Robin used to work with a man who became a church music director with whom I later worked. Tracing that forward some number of years, past Danielle’s graduation party (which, if I recall, was one of Ramon’s first visits to Wisconsin), beyond that, I had the privilege of officiating at their wedding, fue la primera y la única vez que hablé español en una boda. Later, when Alexa’s brother Leo was only a newborn, came the misfortune of presiding at the funeral of Danielle’s little brother DJ. He was a delightful young man, with great care and a huge smile and the enormous tragedy of an addiction from which he couldn’t escape in this life. A couple months after that, yearning for something positive, we celebrated Leo’s baptism and how blessing continues in our lives. Danielle’s father, Darrel, polished the baptismal font to sparkling. Yet to come, he and I have long talked about doing some icefishing together. So there’s a lot there. In one respect, that’s the kind of stuff I’m honored to anticipate sharing with you, the big celebrations, and hopefully not too much tragedy, and all kinds of really regular moments and conversations and details. Much larger and more important, though, than me as a pastor who happens to intersect with your life is the notion today that Christ is the King of this. As King or Lord, it means all of this falls within the realm of Christ, under the influence of his reign and his jurisdiction. He has claim that extends over and around all of these moments. In Alexa Rose’s baptism is the declaration that nothing in her life will be separated from Christ or left outside of his blessing: her delights in her big brother and her smiles at her parents. Their efforts in so many ways to keep her secure—in providing a home and working long hours and throwing birthday parties and struggling against society when its racism or sexism or tribalism would threaten her wellbeing. Christ is in connections with grandparents and the guidance and care of her baptismal sponsors. All of this is held and nurtured by Christ. And the promise continues far beyond what we know today, as she grows and meets new friends at school and discovers what her interests and passions and abilities are and as she begins making choices in her life (whether good or questionable, as all of us experience), on through years and decades. We know this love and blessing of Christ was with Ramon and Danielle at their wedding, but we also confess with sure and certain hope that even death couldn’t separate DJ from love and life and blessing in Christ Jesus. Christ as King must be amid threatening politics just as surely as icefishing. Today we identify that for Alexa Rose, through the thick and thin of it, through the sorrows we’d so much like to spare her and the triumphs we wish heartily for her, all the way to her final breath. And then, even as today we’re holding that very moment for a saint at the opposite end of life’s spectrum and saying goodbye to Eileen Bolstad and commending her out of what our care could accomplish, releasing her fully into the eternal care of Christ’s embrace, even in this moment of death we trust a promise of Paradise, that that last enemy will be overcome, and the love and life and blessing in Christ Jesus will continue. So as we trust this for Alexa and for Eileen and as we are able to hold onto it for ourselves, let’s notice that in calling Christ the King, rather than it being a similarity to our typical rulers, we should hear a contrast. When we say Christ is King, we very particularly mean he’s not like other kings, those who rule and control and disregard our lives for their own benefit or whims. This title, exemplified by one being tortured and executed on a cross, clearly is not trying to claim Jesus is the mightiest or the bossiest. He’s not an authoritarian who always gets his way. He’s not in a posh palace separated from the realities of our life. Another aspect of Christ being King also contradicts a common notion about faith and belief, and that’s in what makes him your king. Just as it wasn’t the ironic inscription on the cross that made him a king, neither was it by popular acclaim. It’s not that you invite him into your life. It isn’t the degree to which we attribute credit or how we pray or how we might try to claim favor. Jesus doesn’t need your confidence in order to be king. His work and his reign aren’t dependent on you or subservient to you like that. Though he’s a servant king, he’s not at your beck and call or waiting to do your bidding. He—and he alone among all who would be called king—holds the role by divine right, in accomplishing God’s will. In the language of Colossians, this extraordinary passage that portrays for us the fullest widespread concept of a cosmic Christ—a king of the universe—the thrones and dominions and rulers and powers are subject to him not because they’re reporting for duty, but since his realm encompasses all. So, in a huge distinction, while he doesn’t cause sin, he must in the end still be responsible for it. Tragedies and addictions aren’t attributed to him but neither are they outside of his realm. Even the worst corruption and decay and death, the nastiest and most virulent attitudes, the fiercest exclusionisms, the ugliest religious hatred, the most careless environmental destruction all fall within his redemption, are embraced by his healing love, are purged with the breath of resurrected life. That’s for us, too. For Alexa at her baptism and Eileen at her dying and for your lives overcome with worry, yet bound in his kingdom, we have to confess it is vital he makes the promise good forever in baptism, because he’s not the king we’d choose. He isn’t the leader we’d like. He wouldn’t win elections or popularity contests. Imagine and sense, if you can, some of the despair for the women disciples at the foot of the cross and those men who looked on from a distance. Imagine and sense their loss, their disappointment, their worry. It would be much more appealing to have a glorious and triumphal ruler, who shattered the cross, uprooted its deadliness, saved himself, then swung out with a force-field that brought his opponents to their knees and protected his chosen ones and helped us always to escape the worst scenarios. That’s not Christ our King. Our model is, yes, compassion and sacrifice and a long arc of justice. But the most important and most difficult word today of Christ as King is so countercultural you’ve likely hardly heard it in recent weeks: forgive. We may be surprised or even skeptical that it should be part of baptism for precious little Alexa Rose, but she’ll need it, and Christ will still be for her then. And as it sets her on the course for receiving forgiveness, it also prepares her to be forgiving. This is the challenging reconciliation that is at the heart of Christ’s kingdom and stands so starkly in contradistinction to all other authorities and rampant blame. “Father, forgive them, for they do not know what they are doing.” We are people striving to embody God’s justice for our world in these days, but our identity is not just in trying to do better, much less in feeling better about what we’re doing or more self-righteous. We are people challenged as we give our lives in sharing this prayer: Father, forgive. Forgive their selfishness. Forgive their prejudice. Forgive their violence, their greed. Forgive their hatred. Forgive their incompetence or ignorance, that they don’t know what they’re doing. Forgive their disruptiveness and destructions. Forgive their incivility and immorality. And me, too, forgive me. The Good, the Bad, and Who’s Godly? Today we rejoin the Revised Common Lectionary. After fruitful and pleasant byways through oceans and with animals and amid storms and across the universe, we’re once again re-entrenched in sad realities of humanity, readings brimming with issues of arrogance and shame and exclusion. Now, you may not feel you need to have these tendencies pointed out to you since, you’ve got American democracy, which has seemed intent on highlighting the very worst possibilities of gloating and blaming and fostering divisiveness and refusing to be humbled or shamed. But we’re likely not looking to politicians as our examples (tragic though that may be), so maybe it is worth re-grounding ourselves in these Bible readings. It strikes me that there are sort of four quadrants or types in the mix of characters today. There are wrongly proud and rightly proud, and rightly humble and wrongly humble. Let’s begin with the glaring example: the wrongly proud, namely the Pharisee in our Gospel reading or as Linda portrayed it for the children, as she is boasting about her devotions and comparing herself not only favorably but superlatively over others. She could use the elementary school reminder that when you point a finger at somebody, three fingers are pointing back at you. A couple obvious notes about her: First, she was not doing a bad thing, but was trying to claim extra credit for a good thing. Our spiritual practices aren’t to earn us points. We don’t pray so we can use it as a bargaining tool. We don’t come to church as leverage to convince God we’re better than others. Even tithing, that the Pharisee returned 10% of her income, is a good and worthwhile devotion. She’s not hoarding. She’s helping sustain the religious institution. She understands that what she has isn’t simply hers earning to be disposed with as she likes but is shaped by her connection to God and the community. During this time when we attend more directly to our giving and financial devotion, I’m certainly not going to tell you that being intentional and committed about how much you give is wrong. But I will remind you it’s about your faith practice and about the good of this community. As I suspect you already know, the return on your investment here is much more delight and joy than something to be held over others. Which brings us to the other thing to notice about the wrongly proud Pharisee: She has herself awfully convinced that she’s better, that the tax collector couldn’t possibly fast or give 10% of his income (much less 11%!). In self-exaltation, she refuses to see others as anything but negative, as “greedy, dishonest, and impure” (in Don’s rendition). That’s the risk for us and the trap we fall into when we only think how terrible others are. In another phrase of Jesus, you end up seeing the speck in your neighbor’s eye but fail to see the log in your own. With the 8th Commandment, Luther’s Small Catechism reminds us that not bearing false witness means we “do not tell lies about our neighbors …or destroy their reputations. Instead we come to their defense, speak well of them, and interpret everything they do in the best possible light.” Whew! Such reflection is so continuously important, partly because it’s so challenging. It’s not just presidential candidates, but we also need to work on perceptions of situations from ex-spouses to violence in the Middle East, from people who are criminals to those who annoy us. A small story: this week when I went to the hospital to visit Ken Johnson, the staff stopped me at the door and told me to wait down the hall so they could do their stuff for him first. After half an hour, I was out of time and they still hadn’t allowed me in. Feeling snubbed, I was hot under the collar even after my bike ride up to church. 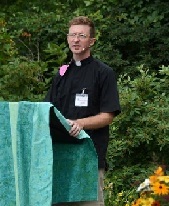 I was frustrated that they were dismissing my pastoral role and disregarding the spiritual care I was trying to bring. I was sure that I was in the right and they were neglecting to understand how right I was, even though I didn’t pause to consider the good they were offering Ken. I’m hoping there’s some gray area, that I’m not just like the Pharisee in wrongful pride and self-assessment, but may also have characterized my role rightly. That uncertainty points us toward the next quadrant, the rightfully proud, possibly exemplified in the reading from 2nd Timothy. The author has done everything right—he’s “fought the good fight, finished the raise, kept the faith,” and is expecting to be judged as worthy of a “crown of righteousness.” His attitude may not be apparently very different from the egocentric Pharisee, except perhaps that the writer of 2nd Timothy isn’t trying to disparage others, but even prayed for them. That might be enough. Or maybe also where the Pharisee elevated himself over others, causing separations, in the case of 2nd Timothy others excluded him. He felt like an outcast, deserted by those he expected to count as supporters. Indeed, in the verses that the lectionary bypasses, he names others who have left to work elsewhere or have somehow disappointed him. It’s a hard line to determine; there are lonely martyrs from time-to-time, those who take a hard stand for the right thing even when nobody else is willing to stand with them. But if we’ve got no community standing beside us and are against the whole world, we probably should be pretty careful about who or what we’re resisting and how our motives or convictions are formed. With that feeling of abandonment or oppression, we may move from the rightly proud to the wrongly humbled or ashamed. There may be an edge of example in the Pharisee’s prejudice against the tax collector. Partly since we have a better sense of self-esteem than when our Bibles were written, this is a category we need to be aware of. We have come to realize that hierarchical powers label others with great detriment. Women and those without white skin have been told they’re not as good. Gender identity or sexual orientation can become marks to make people feel ashamed, as if there’s something wrong with you. Or here in church: even if you don’t know the words for the liturgy or where to find things in the hymnal, if you’re a child who has been told to be quiet or a young person who hasn’t been fully embraced, if you’ve wondered if you’re wearing the right clothes or others are looking at you out of the corners of their eyes because you’re not here often enough, then you might know some of this wrongful shame, the place imposed on the tax collector by the Pharisee. To be shamed (by another) is wrong. On the other hand, to be ashamed yourself may be right. We can still feel the force of this parable from Jesus because we might always want to claim excuses and exceptions for ourselves. But we have to notice that the tax collector wasn’t claiming something better for himself. It was wrong of the Pharisee to put him down, but it wasn’t irrational for the tax collector to feel shame; as Don indicated, he was an agent doing the dirty work of the ruling oppressive empire, taking wellbeing away from others by confiscating their livelihood. For modern parallels, just as I’d hope we as religious people trying to be faithful aren’t equivalent with the wrongly proud Pharisee, neither should we equate that ancient tax collector with the IRS. Rather, we should see ourselves in him, pondering where we are agents of harm and oppression, collaborating with rotten and unjust systems, asking why we ought to feel shame. Maybe for all of our items labeled “Made in China,” we should hang our heads and beat our breasts. Maybe he felt humiliated because he wasn’t able to change or escape the destructive system. Or maybe his humility wasn’t because he was a tax collector but that he had yelled at his family or been grumpy and pessimistic about the news or had cheated on his diet. Or maybe it was like the section I was reading again this week from Pope Francis’ ecojustice encyclical that said, “we should be particularly indignant at the enormous inequalities in our midst, whereby we continue to tolerate some considering themselves more worthy…more human than others, as if they had been born with greater rights” (2, V, 90). Maybe it was the very basic note that the tax collector didn’t need to count himself as better than others that enabled him to go home, as Jesus says, in right relationship with God and opens up God’s potential for his life. Another perspective of being rightly humbled is in the words from Jeremiah. We only get a snippet of this stunning passage. The chapter begins by saying that these words were concerning a drought. Clearly the people were mourning and lamenting the drought, yearning for some rainfall. It says the farmers are dismayed (v4) and, in a heart-wrenching detail, that “even the doe in the field forsakes her newborn fawn because there is no grass” (5). I find it remarkable that this ancient biblical story attributed the ill effects of weather and dire results of a changed climate to the people’s bad behavior. Compared to their superstitions, our scientific understanding of our behavior and witnessing the catastrophe we are causing should certainly give us their sense that “our iniquities testify against us” in Jeremiah’s language and to “acknowledge our wickedness.” That would be honest shame and being righteous humility. For all of this being about our attitudes and self-perception, we must close with a life-giving word on God’s attitude and perception of you. The most stunning word amid these sometimes bleak readings today came in the middle of the Jeremiah passage: “Yet you, O LORD, are in the midst of us, and we are called by your name.” Even recognizing the wreckage they’d caused their society and environment couldn’t disrupt that core identity, and maybe it even contributed to their repentance and desire to do better. This is your prime identifying mark. You are not known for the supposedly pious things you strive to do, not in the credit you claim you deserve, the accolades puffing your chest or the awards put on your shelf. You are not identified by how great you or others think you are. But neither is notoriety in what you do wrong or the marks that threaten to exclude you. And it may well be that in humility or even amid the desperation of shame, you see most fully your identity is secured by God’s presence and that you are marked and claimed in the name of the Lord. That is why we turn to baptism now for Grayson Ward and Harrison Maxwell, sons of Marcie and Chris, to speak God’s promise to them that they are claimed and chosen. No matter how they continue to live this out in life, if they go on as well as we anticipate to receive praise and earn trophies or are labeled for some reason as wicked, as outcasts, as greedy or impure, as lowly and shameful as the rest of us, through it all, they are sons of God, known by God’s name, beloved forever, freed and forgiven. Thankful and joyful, let’s sing in celebration of this identity. In the MCC Vision-Tending team that is focused on this partnership, in worship committees, and other conversations have been requests about better understanding each other. We’re not smushing together denominations, but sharing while also maintaining our individual unique identities and beliefs. Of course, at MCC that’s still not just two categories of beliefs but uniquely proliferates to each of us gathered now. Still, this World Communion Sunday, celebrating what it means to be together and partaking in sacraments seemed like an appropriate time to reflect on similarities and differences. So this is a fast reflection on the general Lutheran sense of sacraments. Clearly that can’t hit all the questions, but will at least try to establish a core. I want to jump in with the song the Chimes just played for us: Yes, Jesus loves me, the Bible tells me so. That’s a perfect place to begin, making us ask: do you know Jesus loves you because of the Bible? The standard tale claims somebody hanging by a thread could open that well-stashed Gideon copy in their hotel’s drawer. But they most likely wouldn’t open to a passage that told them Jesus loved them. They may hit a part with rules they broke or a violent historical account. Even if they found exactly the right verse, while at rock bottom they likely wouldn’t believe that that message of love could be for them. That Bible, they’d figure, must’ve been written for somebody else. Preaching is intended to resolve that gap, declaring to each other the message—or the Word from God—that Jesus loves you. Not that Jesus loved a type of person or somebody back when the Bible was written. Or that Jesus loves generically. The message of a sermon, or when we proclaim the gospel to each other, is that Jesus loves you. Yes, you. Still, that’s not foolproof. You may remain unable to hear my voice as a word from God applying to you. Given that I don’t know what you’ve done, can I claim that God could love you? Or you may have had a rotten week which sure didn’t exhibit God’s love, so it may still feel like the message is for someone else. Plus, I stand up here, and some of you sit way in the back. Which brings us to sacraments, to Baptism and the Lord’s Supper, as Jesus trying to ensure the promise is delivered directly to you. In baptism, as the water hit Sawyer’s and Auden’s heads, it came with God’s declaration, “You are my son, my daughter, I love you. I will always love you, no matter what.” That promise was delivered with the splash of water so that Auden and Sawyer may trust it was exactly for them and nobody else in that moment. And as you take a nibble of bread and sip of wine, Jesus is promising that he is there for you, with the fullness of his gracious, forgiving, loving presence, offering his life and all he has. For you. No matter what you’ve done, no matter how you feel about it, this is for you. Saying this is Jesus’ body and blood almost certainly raises questions. Those of you with Catholic backgrounds know transubstantiation. Well, Lutherans don’t go in for that hocus pocus. * Instead, we might begin to ask: where is God? Quickly we’d respond that God is everywhere. That means God is in my shoe and out in the chicken coop and God is in the bread, because God is ubiquitous. But the importance is in knowing where to look for God. We tend to look at death or tragedies, at refugees of war or a frustrating political mess and wonder where God could possibly be. That’s the situation we’ll hear in Habakkuk. But it’s vital not to be stuck with the guessing games of where God might be or what God might be up to. Instead here is the confidence in water of God promising love. God is in a piece of bread to offer forgiveness and life. So even when it’s miserable and you’d wonder if God forgot about you or maybe you’re even being punished, you can rather remember your baptism, receive and taste again the assurance of Jesus with you. Though it’s surprising that God would use packaged bread from the co-op and Wollersheim wine and plain ol’ unholy tap water, you may even more doubt another of God’s means and ends, meaning me and you. First, what makes me a pastor? I’m a scrawny young goofball, and certainly no better than you are. But this role isn’t about being holier or having magical mojo. Really, anybody can say these words, just as whenever you’re told God loves you. I’m just here for reliability, hopefully so you can count on me (and the same for Sonja). I’m paid to hang around this place so when you need to be told God loves you, you can rely on me to say it. And I’m supposed to do that for you with God’s utter abandon, with the total unconditional sense, not based on how good you’ve been or likeable you seem or anything like that. God is so reckless and so insistent on this love that it’s not based on earning it at all, as 2nd Timothy says (though indirectly, as I’m having to apply that message for you now). For this constant support and guide and resource, God chooses even babies. God makes this promise before we can prove how we’ll turn out in life at all. With that was an interesting Confirmation discussion this past week. One student said she would’ve preferred a choice about being baptized. But do we ever have a choice about being loved? We can run or reject or rebel, but we can’t stop being loved—in good instances from people we know, but always from God. God chooses love before all and through all. Alongside that, it strikes me as a little silly that we have elected that teenage as the time for Affirmation of Baptism. That age in life is about exploring all the edges and possibilities, pushing boundaries and testing authorities. Most teenagers would be hard-pressed to claim the love of family, of which they’ve had good evidence, so why ask them to affirm a love from God that requires much more uncertain trust? Still, that exhibits the persistence of this promise. Jesus is still for you, still striving after love, still offering life, continuously working for and through you, whether you think you understand it or not, can explain it or not, whether you’d choose it, ready or not. And that’s some of the important Lutheran word for a World Communion Sunday, that this isn’t limited by or dependent on how well we’re getting along or how well-qualified anybody thinks we are. This is the presence of the Holy Spirit more constantly than we can imagine and can only begin to trust. This is God’s way of using the mundane as sacred, the unexpected blessing, the earthy for godly purposes, the ordinary as miraculous, in bread, wine and water, from common folks, in drawing a diverse group of us together, binding us across the world, throughout the generations as family, and motivating us to share this life with all. *As delivered, I’m realizing this was poor word choice. Behind it, “hocus pocus” was a term from those who didn’t understand the Latin “hoc corpus meum est—this is my body,” and thought the priest had powers in magical incantations to transform the bread to something else. But that distinction got lost in what seemed like making light of disparaging others’ beliefs. I apologize.